I love this time of the year where I can start growing things again and enjoy that faint smell of spring in the air. All the flowers, my garden and especially herbs. I know many of you won’t see the warmer weather for another month or so. 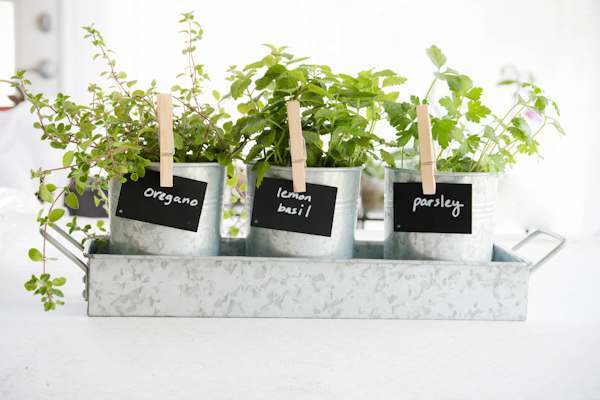 But if you are ready to “get yer hands dirty” now, how about making a simple little kitchen herb garden. I choose herbs that I know will do well indoors like basil, parsley, chives, rosemary, oregano, thyme, lemon balm, and different mints. Rosemary is really hardy and will grow into a bush if you let it. They are also great to train into topiaries. 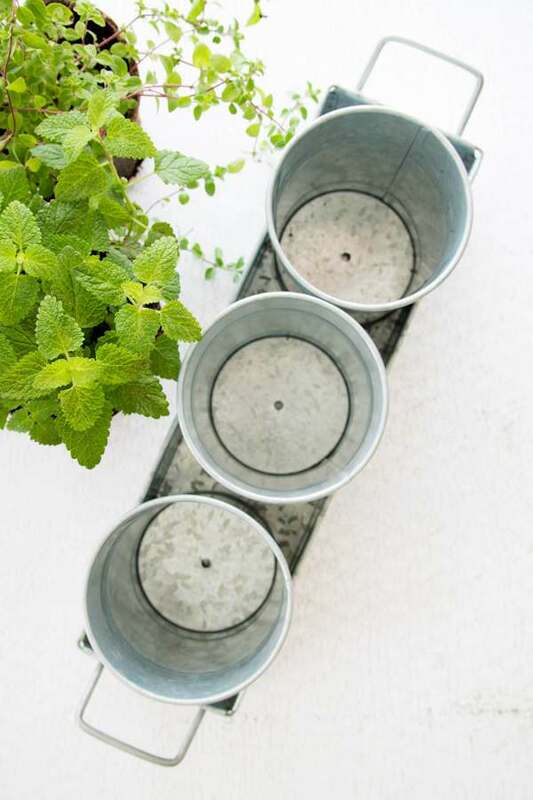 I love that this potting trio already has the holes in the bottom of each pot. Sometimes I will start herbs by seeds and grow in the garden, but for this project, I needed grown herbs in small pots you can find just about anywhere in the spring. I did remove the biodegradable pot the herbs came in so I could fill in the extra space with dirt. After planting the herbs, I just added the name of the herb on the chalkboard tags with my chalk pen and secured each one on the pot with a clothespin. This project took just minutes to put together and what a great idea for a new neighbor just moving in. There are so many different types of containers to use, such as Mason Jars, baskets, small terra cotta pots, vintage cans, etc. Just make sure you put small rocks in the bottom of the containers to help with drainage that doesn’t have holes or line with plastic. I have also made a Mason Jar Herb Garden and Recycled Can Herb Pots using the same process. Herbs don’t like their feet wet or sitting in water, so just keep the soil damp. When the plants get too large for these smaller pots, they are ready to be transplanted to your garden or larger pots outdoors. This is so beautiful and easy steps. Loved it so much. I will do it too. Always wanted to have a herb garden and I think after we moved house, my kitchen window is the best place for cute pots of herbs. Can’t wait for spring. THAT would look so good on the little mantle above my sink!! So cool! I could try to do this, but I’d probably kill the poor plants. I am terrible with keeping plants alive. I love this, I am moving soon and really wanna start growing my own herbs and this was a total sign for me. Gonna pin this so I can refer to it later. Thanks! I’ve been struggling to keep basil and cilantro going in pots on my window sill but they don’t look nearly as pretty (or healthy) as yours do. My mom has always wanted to grow her own herbs. I will have to show her this post so she can have a new DIY idea! Oh now I might have to give this a try I can imagine it looking lovely placed in the kitchen window. 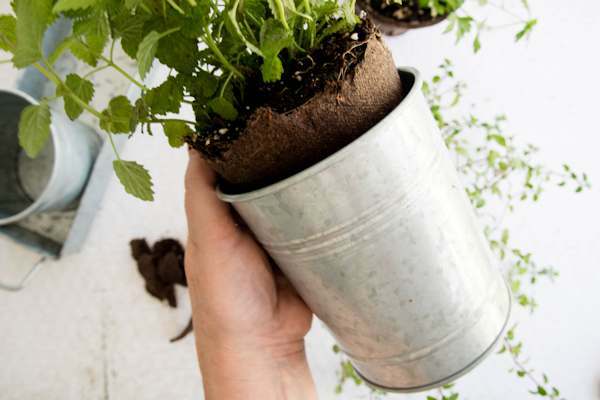 What a wonderful and easy way to grow your herbs inside. 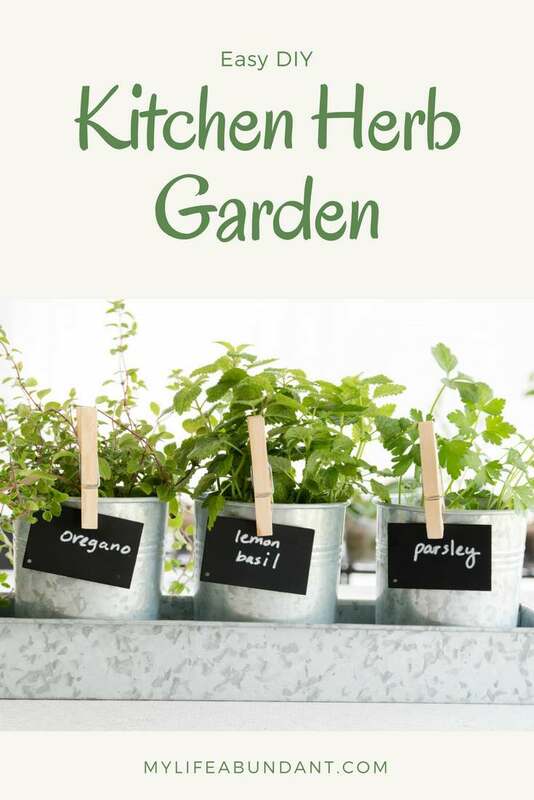 I have alway want to grow my own herbs but had no idea on how to start. I pinned this. I think it is fun to make a herb garden in the kitchen I will do this one day. 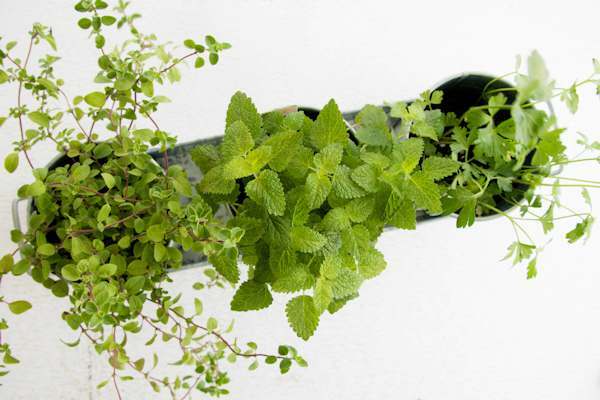 This is such an awesome idea to have these herbs that you use so much fresh and at your disposal. I am not a huge cook but I do like to every once in a while. This would be so awesome to have! i am jealous of your herb garden! theres nothing more i want. i have been looking around in home/plant stores for the perfect plants to have in my house but keep running into an issue because i can’t find the style of pots i want. the ones you’ve got have given me an idea of what i can base mine on. Good timing on this post. We’re revamping our garden and are looking to add herbs as well. This looks so cute. I miss have an herb garden of sorts for my house. I loved cooking with fresh herbs. It’s so much better that way.